As a child, I took a lot of road trips with my family. We had a motorhome so our road trips involved a lot of driving, campgrounds and scenic tours. Travelling with kids isn’t always easy and long drives can be tough for any age. Here are some road trip tips to help make the most out of each day without too many “are we there yet” questions. Make sure you schedule yourself enough time for driving and fun. Sure, you’ll get to your destination faster by limiting stops along the way but chances are everyone will start to get cranky if they aren’t able to get out and stretch a few times a day. While preparing for your trip, make a scavenger hunt list of items that your kids can search for at each pit stop. Too busy with your packing list to have time to make a game? No problem! 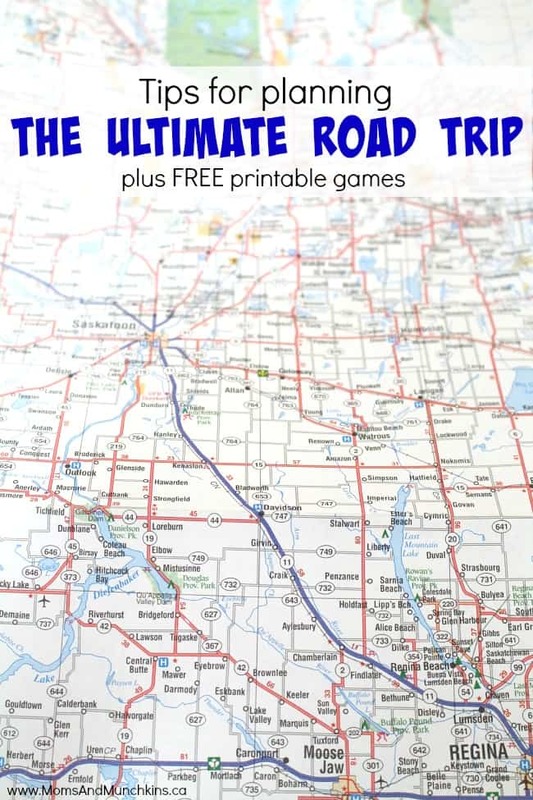 You can print this road trip scavenger hunt game for free. Research your route ahead of time and see if there are any fun or unique landmarks you can stop at along the way. Don’t forget your camera! As part of your planning, insurance broker Western Financial Group (Western) recommends taking a look at your car insurance policy to make sure you’re covered. While all Canadians are required to have car insurance, a recent study by the company found that only 22 per cent of drivers are extremely confident that they understand what their coverage includes. They suggest discussing your policy with your broker to ensure you are covered for your trip, particularly if your road trip will take you out of the country, or into another province. Before you head out the door, Western also advises travelers to make sure you’ve packed any necessary documentation, including up-to-date prescriptions, contact information for your insurance broker, and identification for everyone in your party, including children. After all, road trips are special family time, and should the need arise, you don’t want to waste any of your vacation time trying to gather papers that are at home! Instead of stopping at a restaurant for three meals a day, mix things up a bit by stopping at a deli and having a picnic in a park. Rather than going out to a busy restaurant to eat at the end of a long day, maybe you could have a pizza party in your hotel room while renting a movie and snacking on popcorn. While you’re driving, have the kids draw themselves pictures then stop at a post office and mail them back to your house. Kids always love receiving mail! Bring along some finger puppets to turn regular storybooks into mini productions in the car. Bring along your video camera and make up some fun news reporter movies at each location. For example, is the town getting ready for an annual festival that you could talk about? Is the town known for something special that you could turn into a mini news segment? Set yourself a goal to do a certain number of random acts of kindness while on the road trip. An example could be buying coffee for the person behind you in the drive-thru. 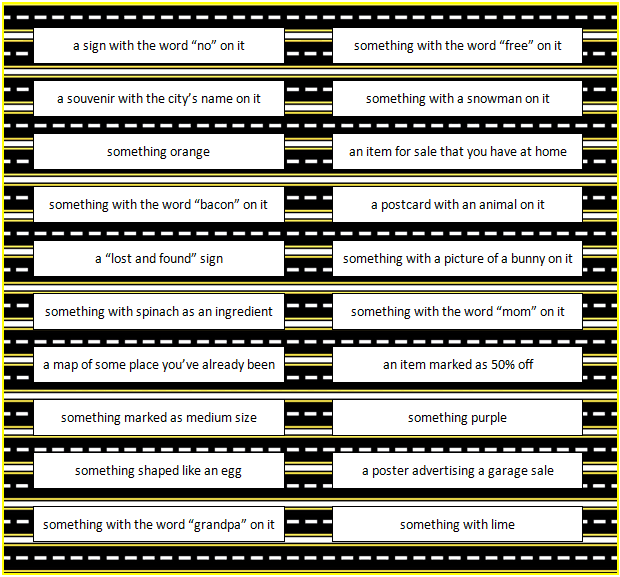 Play a game of I Spy BINGO simply by looking out the window and trying to spot the items noted on your game. 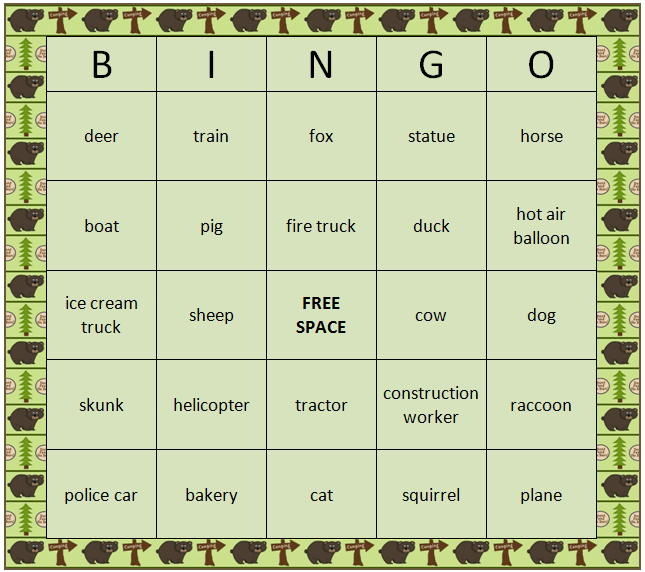 Print this Road Trip BINGO game before you leave home and pack it in the vehicle. On the drive home, start planning your vacation scrapbook. Document some of your favourite funny moments so you remember to note them in your scrapbook later. If you enjoyed your road trip (which you surely did!) and see more in your future, Western recommends considering year-round travel coverage – a cost-efficient option. Your broker can help you find a policy that fits your budget and can be tailored to how often you’re crossing the border, which will help save some time as you pack up for your next adventure. Remember that your vacation starts the moment you leave the house & not just at your final destination. Start your vacation activities as soon as you leave the house and make the most out of each day with your family. You’re sure to remember these moments for years to come! Whether you are taking on a brand new adventure this spring break or pursuing your favourite hobby, have fun and stay safe! More information on travel insurance is available at www.westernfinancialgroup.ca. *Disclosure: This post on Road Trip Tips has been sponsored by Western Financial Group; however, all opinions expressed here are my own. Great to see a fellow Saskatchewanion. I was born and raised there and my heart will always be in Saskatchewan even though we live in Alberta now. Great designs and a fun site. Thank you so much, Debbie! Yes, I was born and raised in Saskatchewan as well then I lived in Calgary for 10 years. We’re back in SK now so that my son can be closer to his grandparents. We do miss Alberta though! Hey, this is a great post that I stumbled upon. Thanks for posting those great game ideas for kids, so handy! My vacation this year is a driving trip to France (I am UK based) but it seems that country has a few laws that I need to be mindful of. I only heard about them from a family member but I am glad that I did, so that I can prepare. For example, a car break down on the motorway in France can lead to a fine so I am organizing breakdown insurance that will cover my trip. Also, French law requires you to carry an approved self-test breathalyser in the car, so I have plenty to get organized for my trip!